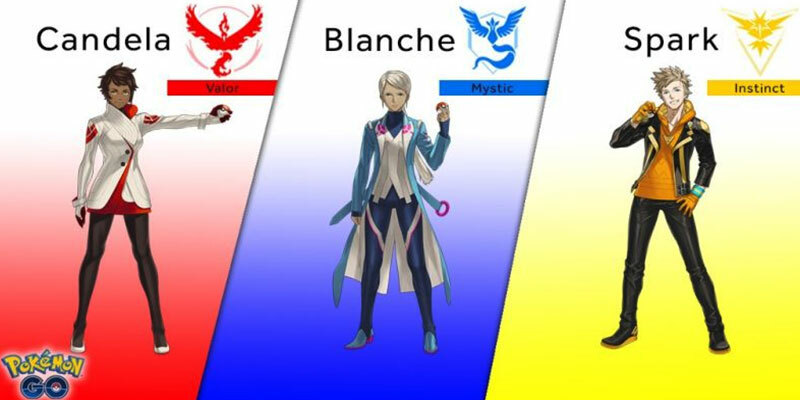 If you’re past level 5 in Pokemon Go, you must be a member of Team Instinct, Valor, or Mystic led by Spark, Candela, and Blanche respectively. However, until a couple of days ago, you didn’t know how the team leaders looked like and had to deal with the legendary Zapdos, Moltress, and Articuno as the mascot for each team. And, when you first met the team leader, they were silhouetted in their respective team color. However, the leaders were finally unveiled at the Comic-Con 2016 taking place in San Diego. John Hanke, the Chief Executive Officer of Niantic, the developers behind Pokemon Go graced the event. Candela, the Team Valor leader, wears a white jacket dotted with a red accent to match her team’s color. Blanche wears a long blue trench coat, in line with her team’s theme, and striking shoes to match. Spark, who happens to be the only male, wears a gold-colored hoodie with matching gold gloves. Those in attendance were quick to mention that each team leader evokes the characteristics that players have come to associate with their respective teams. Hanke said that even though Pokemon Trainers should not expect to see any new Pokemon in the game in the near future, more generations of creatures may appear in the long run. New features might pop as well such as Pokemon Centers although it’s not clear which functions they will serve in the game. The company’s management retaliated that the game is here to stay that they haven’t even scratched the ground yet. According to Hanke, the Pokemon will get even more exciting once the team starts to roll out regular updates. “It’s stuff that’s not in Pokemon Go today but is something we are working on bringing to the product, We expect Pokemon Go to run for years, and we are going to continue to invest in it in that way, ” he said. On the crashing of servers, Hanke stressed that his company is doing all it can to keep the servers up. He added that the stability of the servers is paramount as to when the introduction of trading will happen. Trading involves the inclusion of a feature that will allow players to swap Pokemon between themselves. Despite the hiccups, Pokemon Go is still on a roll and shows no signs of slowing down. In fact, since its launch in Japan, the home of original Pokemon, it has proved to be a major hit and has even attracted a McDonald partnership. Harry Potter: Wizards Unite – An Exciting, New Niantic Adventure!